A professor of engineering, Jay has built 15 wooden bicycles and teaches the craft, as well. The “Ride-able Art” of Jay Kinsinger The 21st-century understanding of the bicycle is almost invariably inorganic. Bicycles, grouped with other forms of transportation, are thought of in metallic, manmade materials—although, in fact, the first bicycles were made of wood. Against the ubiquitous frames of titanium and carbon fiber, the work of Jay Kinsinger is a beautiful reminder that natural materials can be just as strong and functional as their manufactured counterparts. Jay, a professor of engineering at Cedarville University, has built fifteen wooden bicycle frames since 2011 and has walked a number of other people through the process of building their own bikes. 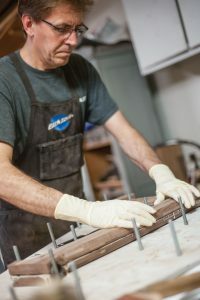 In creating his frames, Jay brings together two of his lifelong passions; he has been working with wood since around age five, and riding bicycles since six. As durable as they are beautiful, Jay’s bicycles surpass the standards for steel frames. The making of a wooden frame is no simple feat. Jay’s first took somewhere between 350 and 400 hours to complete over the course of five months, although he has cut that time down to about 100 hours for his more recent creations. He begins by creating two full-sized drawings with a CAD (Computer Aided Design) system, adhering the drawings to plywood or fiberboard, and cutting two templates: one for the exterior shape of the frame and one for the hollow interior cavities. For the frame itself, he prefers to use walnut, which he appreciates for its strength, lightness, and beauty. (Other woods, such as spruce, ash, hickory, and mahogany, could also be used.) The inside of the frame is reinforced with steel in several places. After being roughed in with a router, the outside is shaped with chisels, rasps, files, and sanding, then finished with a dozen coats of gunstock oil. Jay laminates wood for structural strength. Jay’s creations are hollow and weigh less than steel bike frames; however, their lightness is no indication of their sturdiness. The wooden frames have been tested according to the rigorous standards of the bicycle industry and have passed with excellent results. One test involved applying pressure to a certain section of the frame until it buckled. While a steel frame will begin to fail at 800 pounds, Jay’s wooden frame held out until 1,800 pounds. The orientation of the wood grain in relation to the stress being applied is a crucial factor in the strength of the frames: when the grain is perpendicular to the stress, the frame passes (and surpasses) industry standards. In addition to lab testing, Jay’s bikes have seen many miles of use by himself and his family of cyclists, both at home and abroad. 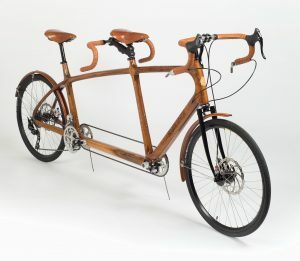 A wooden tandem bike supported Jay and his son on a cross-country camping trip, and that tandem joined four folding wooden bikes to accompany the family on a bicycle tour through Europe. Jay and his son took a tandem bicycle on a cross-country camping trip. 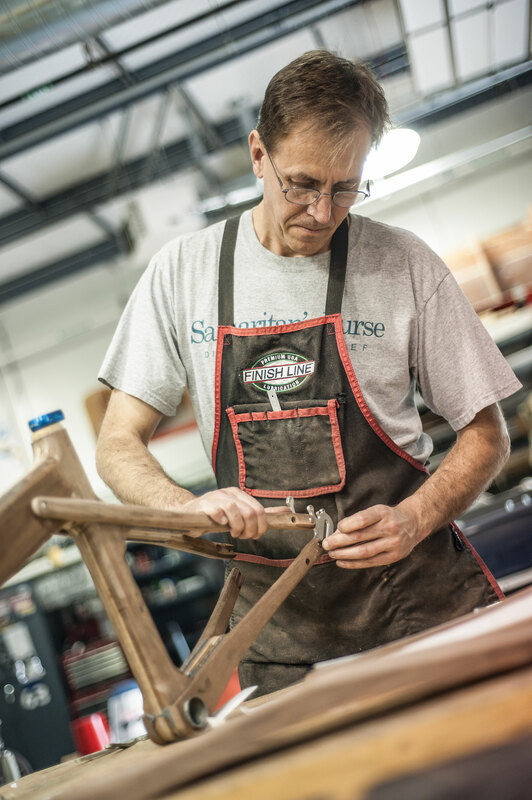 Jay is often asked why he chooses to use wood for his bicycle frames. He has a long list of answers to this question. Wood provides a huge number of design opportunities, from the many types of wood to the unlimited possibilities for shape to the option of additions like carvings and inlays. Wood also absorbs vibration, making for a smoother ride. Scratches and dings can be easily sanded away on a wooden frame, whereas such marks are much more difficult to remove from metal. A wooden frame can be built using basic woodworking tools, with no need for welding, which means no need for expensive welding equipment. As a resource, wood is sustainable—in Jay’s words, “it’s hard to find anything ‘greener’ than a tree.” His final point is a simple one: wood is a beautiful material. It can be breathtaking to see the detail of the grain come into vivid focus after sanding and finishing. In spite of the time and effort that wood requires in comparison to other materials, Jay has more than enough reason to prefer it. The positive response to Jay’s bicycles has been significant; he has received many awards at judged competitions, including two Best of Shows in Dayton Carvers Artistry in Wood, Best of Show in the 2014 North American Handbuilt Bicycle Show, and Best of Show from Bicycling Magazine in 2014. On a day-to-day basis, the frames draw a good deal of attention at bike rallies and on the street. Jay calls his work “rideable art,” and it is easy to recognize the artistry present in the smooth lines and sleek finish of his frames. 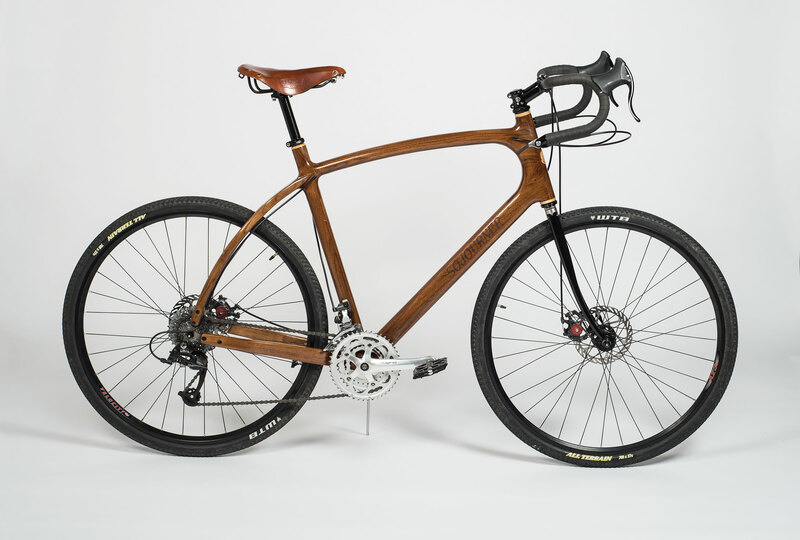 As striking as they are durable, Jay’s bicycles are a reminder that even today, wood has not lost its place as a distinctive, reliable medium. Jay’s website can be found at sojournercyclery.com. Click Here to discuss this article on our forum.